So you’ve decided that your fence needs a makeover, or maybe it is necessary for you to build a new one? Regardless of your reason for investing in a new fence, it is imperative that you choose the best design for your Austin, Texas home. This includes both the aesthetics of the fence as well as the durability of the materials that it is made of. Alternatively, it is important to consider how your new addition will affect your neighbors and their yards. A new fence may be an added barrier between you and your neighbors, but the right look can actually assist in building your relationships and establishing new ties. Wooden fences are typically a means of physical separation and seclusion from your neighbors; make those boundaries beautiful by installing a good neighbor fence that offers an appealing view from either side. The alternating design of these fences prevents your neighbor from getting stuck with the “ugly” side with all of the bracing and support facing their property. The pickets in good neighbor fences are staggered, which allows for space between the boards while still protecting your yard. The structural elements of our good neighbor fences are hidden between alternating pickets, providing a pleasing balance between privacy and the ability for open communication. Apple Fence Company fabricates everything in house, which assures that you get the highest quality fence possible with a quick delivery and turnaround time. We make sure that our fences are unique and will suit you and your home’s style. Our wood fences are made with treated lumber or Western Red Cedar, and if properly maintained, can last up to 20 years. We offer many options so that you can get the custom fence you (and your neighbors) deserve. Beautifying your neighborhood with our top-quality materials and designs may be just what you need to increase the value of your property, as well as create a new way of connecting with those living around you. Let’s get started on your Good Neighbor Fence! 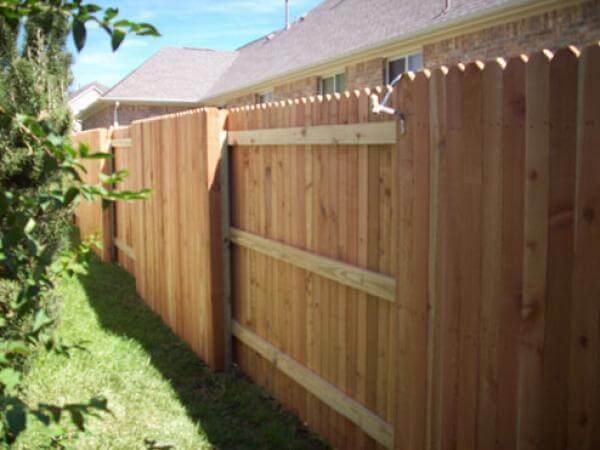 We have helped those in Leander, TX and the surrounding areas protect and beautify their properties with affordably-priced fences for over a decade. It can be nearly impossible to satisfy yourself as well as those around you – a good neighbor fence from Apple Fence Company is a step toward neighborly harmony. Call now for a free consultation, and we’ll show you why we’re worth your investment.